After nine months of looking after the hostel, of being the lovely welcoming face for our guests and generally being invaluable, Nathalie left yesterday to continue her travels. Off to France! It was hard to see her leave -she’s become a very good friend and Snuffy is bereft. Nathalie, thankyou -and we’ll miss you! Winter is sliding into the past. Life is returning with shoots and buds wherever you look and spring, if not here, is just around the corner. The excellent Eva and Thomas are busy around the place. Eva keeps the hostel sparkling (and has also planted hundreds of willows) and Thomas helps me out of doors with all the variety of jobs needing done. Today, for example, we replaced the stile on the beach between Lagandorain and Calva, had another bonfire of scrap naily wood, helped Colin who arrived with his tractor carrying a lovely slab of stone as the plinth for the woodburning stove (byre), shifted Clovelly from in front of the byre and Thomas then did a major clear up of the area where the boat has been sitting for the past three years. Brendan (boat-builder) has been over for the past few days doing more repairs to the Black Boat in the barn and I’ve just returned from being ‘dolly holder’ as he put new nails in the couple of planks he has replaced. Eva, in the meantime has been busy out in the garden. All very satisfying. An odd thing happened yesterday. I was down on the beach with Snuffy. The tide being quite high I decided to roll a dead young seal back into the sea (not one of the ones I photographed, but smaller) It’s been there on Calva for ten days or so and was becoming less bonny by the day. Snuffy was entranced by it. It therefore seemed a good opportunity to put it back in the sea where it belonged. As I rolled it (as gently as I could with my wellies) back down to the water a large seal appeared very close inshore, reared up and watched intently. It didn’t just raise its head as they usually do -this one was right up and out -and there it stayed until the dead young one was back in the sea and drawn out by the falling tide. Then it vanished. Make of that what you will. The young seal was doubtless sickly and the weakest of the litter. In English, and commonly used now across the country, it would be described as the ‘runt’. An ugly, demeaning word and one that is almost impossible to imbue with any kindness. Try it out loud -it’s little less than a g-runt, reductive and brutal. It wasn’t always so and dialects and different areas of the country had their own words and ideas about such things. The Fifers seemed to get it right. They called them ‘Weirdies’, that being, something supernatural or special: a gift. Such human-kindness doesn’t to me suggest sentimentality or feyness, rather, it is a sign of something generous and strong. How sad that in our age we should use a word so lacking in these qualities. Thick mist over Iona for the last couple of days. Hopefully tomorrow the sun will come back out. 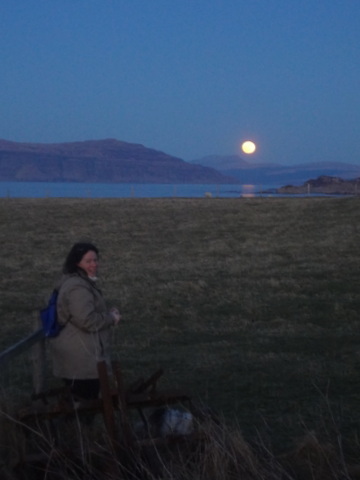 To finish, a photo of Nathalie on her last night with a full moon rising. Thanks for writing and it’s very nice to hear from you. Yes, folk seem to enjoy the poems. To be honest, it was a fun thing for me to do that let me avoid doing more important work ! My taste in poetry isn’t sophisticated -especially for under the bunks. 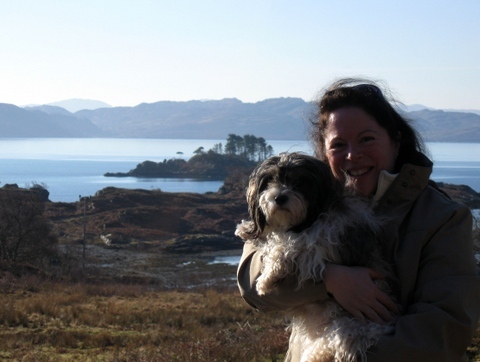 it has to be short, easily read, thoughtful and have something losely to do with Iona or landscape. I like Frost too. I’ve never got into Facebook though I know plenty who love it and it does seem to keep them in good contact with their friends. Hope all’s well with you and that you’re staying warm. We escaped the worst of it over here (no snow) but we did have a wild and cold time of it. C&C are on holiday in Spain at present -lucky them !